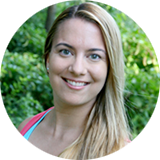 Jessica Bonnema is a certified yoga teacher and certified personal trainer. Having been with Barefoot Tiger since 2007, she enjoys helping others on their wellness path and watching their evolution. A lot of her sessions fuse the personal training and yoga world together, especially with her assisted stretching. Jessica also enjoys theatre, comedy and making people laugh. Over the years she has performed Improv comedy, plays, and has written and performed her own material. She can’t guarantee she’ll make you laugh during your session, but she will guide you by showing you how strong and inspirational YOU are. I think my greatest accomplishment would be completing my 200 hour yoga certification. The intensive was enriching in so many ways: physically, mentally, and emotionally. Not only that, but I feel it launched me in a new direction and has become a platform for many other wonderful things in my life. Personal Story or Experience? Because it’s a part of YOU! You are important, so take care of you. I think exercise and personal health go beyond how we look physically and how we operate physically. After working out I know I feel so much better, I want others to feel the same. My niece Abigail. She is athletic, adventurous, playful, and speaks her mind. I would go to a tropical island by myself. Other than swim all day and take surfing lessons, I would sit on the beach listening to the waves and read a good book. In my free time I read and write. I also like comedy so I’ll either go to comedy shows or try out some open mic nights, for myself.